Did you feel guilty when you refused to add a buck to your bill to benefit a charitable cause when you were at the grocery store last week? If you did, you're not alone. 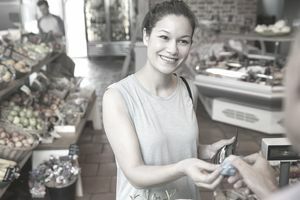 In a survey of this type of charitable giving, 35 percent of consumers who said they didn't like being asked to give at checkout gave anyway because they would feel guilty if they didn't. Guilt works, although most of us don't mind giving in this way. In fact, as we all have become acclimated to checkout charity, its success has bred more campaigns. We are all going to be giving more at the checkout, whether we're buying something online, picking up fast food or doing our weekly grocery shopping. Why do checkout charity campaigns work? Because we like them. Seventy-one percent of consumers in one study said they have participated in checkout campaigns, and 55 percent said they enjoyed doing so. The practice has become embedded in our everyday lives as the latest report from Engage for Good (formerly The Cause Marketing Forum) shows. The 2017 America's Charity Checkout Champions Report only compiles information about 73 million-dollar-plus campaigns by some of the most elite brands and charities, but the results are pretty astounding. Called "point of sale donation programs," just these major campaigns raised more than $441.6 million in 2016 (up 4.5 percent from 2014) and $4.1 billion over the past three decades. Forget donor fatigue when it comes to this type of charitable giving, as far more campaigns increased than decreased over a two year period. Companies and charities are all in on this type of corporate/charity cooperation. These campaigns are just a clue to how big checkout charity has become. Engage for Good, the professional organization for cause marketing, estimates that there are hundreds more company/charity partnerships that raise hundreds or thousands of dollars for many causes, both local and national. What drives this success? The particular charitable cause does matter. The 2017 study found that the most appealing cause was children’s health. For instance, Children’s Miracle Network Hospitals and St. Jude Children’s Research Hospital were the beneficiaries of 48 percent of the money raised in million-dollar-plus campaigns in 2016. Coming in second at 16 percent of fundraising dollars was the ‘consumer choice’ category. This category is exemplified by the eBay for Charity’s program that allows both buyers and sellers to designate their donations to the cause of their choice. Health, hunger, and social services were also frequently-supported causes. Trends in checkout charity include providing incentives to encourage consumer donation, allowing customers to "roundup" their final purchase amount with that part going to charity and better integration with electronic checkout systems. Icon/Pinup - customers purchase a paper icon for a set donation, usually $1, $3 or $5. The icon is displayed in the store. Donation Requests - at checkout customers are asked for a donation by a person or the request shows up on the automated pin pad. Round-up - a trending approach where the customer agrees to round up his purchase, with the round-up amount going to a charity. saying thank you better, such as at the point of sale, and through advertising and PR. In light of the challenge to traditional brick and mortar retailing from online companies such as Amazon, the authors of this study are confident. More and more traditional retailers now offer online purchasing and, after all, adding a donation to a purchase can be done easily online. Checkout charity is just one kind of cause marketing, but it is a lucrative one. It’s a win-win for both charities and companies, and consumers like it.